Here we are, striking out in new directions again, this time in the wake of Frieze overkill and somehow ending up at Gimpel Fils, of all places. But sometimes it’s better not to crave too much, expect miracles from marketing and instead persevere with a little more tradition. Gimpel has always had that. Not that I’ve always appreciated it. 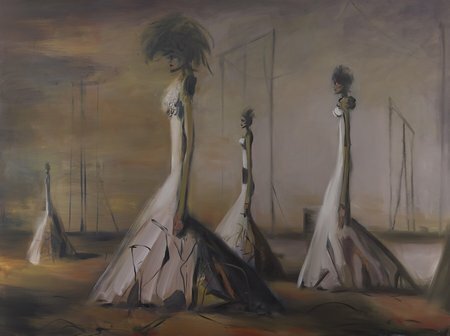 Anyway Flannigan has been around a while, an Edinburgh-based painter working through some female stereotype issues in a loose Expressionistic style. That much was never going to sell me. What I liked was the wonderful lightness of touch in the larger, more ‘finished’ pictures and a surprisingly dour sense of colour – given the melodrama to the figures. Check out A Body Made Itself (2015) and Memphis (2014). It’s a shame the images are so small, but that’s Gimps. Sadly the artist’s website is hardly more generous, although I did find this beauty – Stare from last year, alas not in the show. But I’m loving the double breasted jacket with flared sleeves and what looks like knickerbockers on a constructivist catwalk! How do I meet this woman? If we must have couture in fine art, Flannigan is showing the field a clean set of heels here. On this work alone I’d award her a Turner Prize. 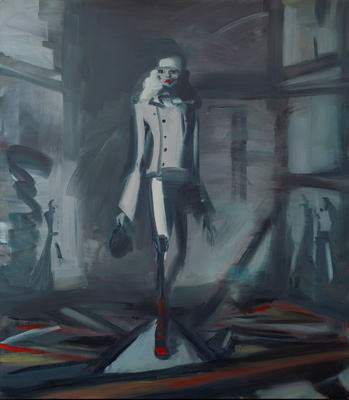 The show, however, is mostly small sketches working through a prone female figure, either struggling for balance or impeded by obstacles, perhaps ghosts – sometimes wearing some rather chic stiletto-heeled boots, (a nod perhaps to Allan Jones?) and I’m not sure I wanted to see every permutation worked through here – ranging from furniture substitute to clubbed-footed Cinderella, by way of Louise Bourgeoise Spider Woman, but the artist is nothing if not thorough in these preparatory sketches and then quite surprisingly, the larger works somehow retain the spontaneity while adding colour, an absolutely ripping facture or touch and as noted, a distinctly brooding atmosphere. Magic. The work manages to be both intensely linear and tonal, casual and yet considered. The effect is a bit messy, a bit of a struggle, but given the subject matter this seems only appropriate. I don’t think I’d heard of the artist previously. 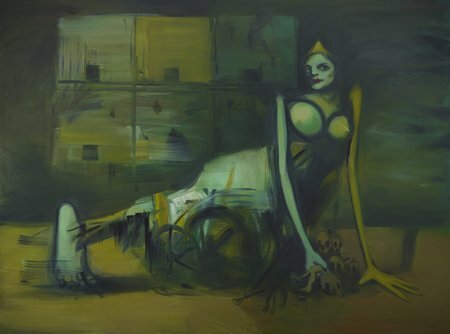 There’s one on the Saatchi site (whatever that means) from the late nineties I think, when she looked more like a Paula Rego fan, on the caricature and children’s creepy storybook tip. We all have to start somewhere of course. I note also she did an MFA at Yale after her degree at Edinburgh College of Art back in the 80s. Those puppies are expensive. Maybe she got a scholarship or something. Still, I suppose it shows ambition. Not for her bumming around Greece for a couple of years getting ripped and having a bit of a laugh! Sigh, not that you can do that anymore... But I suppose we all have to find our own path, in our own time. And hers has mostly been around Scotland ever since, it seems. I think she teaches somewhere in Edinburgh. Maybe I should email her. Anyway this show is on until the 14th of November and although not brilliant is a healthy antidote to the usual Frieze hype.